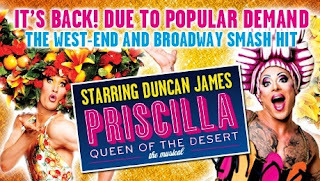 Ostensibly an adaptation of the movie, "The Adventures of Priscilla Queen of the Desert", this colourful and exuberant musical utilises pre-existing songs and elements of the most exquisite Australian drag show to create a production that is exciting, entertaining and thoroughly engaging. We follow Sydney drag artist "Tick/Mitzi" (Duncan James) who is engaged by his secret wife to bring his act to the middle of Australia, bringing along two fellow performers; the outrageous "Adam/Felicia" (Adam Bailey) and transsexual former "Les Girl", "Bernadette" (Simon Green). Traveling across the outback in the eponymous bus, they encounter positive and negative reactions towards them from various factions as they travel to the 'heart of fabulous'; discovering love for each other and for themselves along the way. The current tour captures the essential brilliance of the London West End production - albeit in a typically slightly reduced form (common for UK tours given the venues available) - and the direction of Simon Phillips (reproduced here by James Capewell) stands up strong, as does the book by Stephen Elliot (writer and director of the original film) and Allan Scott. 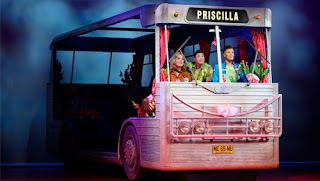 With energetic choreography by Ross Coleman & Andrew Hallsworth and the stunning Tony-winning costumes of Tim Chappel and Lizzy Gardiner (based on their original, Oscar-winning, designs) "Priscilla" is a show with never a dull moment and even the design, adapted from Brian Thomson's original, is colourful and humorous. Credit must also be given to the orchestrator/arranger Stephen 'Spud' Murphy (& Charlie Hull) for making the eclectic songs gel as a musical score, working to the benefit of the plot (as opposed to many a musical of the juke-box variety) whilst ensuring the musical material functions as an essential part of the show. The cast is more than ably led by the trio of Adam Bailey as "Adam" and Simon Green as "Bernadette" who play polar opposites and exude energy and unexpected emotion whilst Former "Blue" member Duncan James is really quite a revelation in the part of "Tick", a role he clearly relishes. The ensemble is a thoroughly integral part of the show and there is not a single weak link. Indeed there is much to enjoy from the company; the ensemble dancers; the glorious "Divas" of Lisa-Marie Holmes, Laura Mansell and Catherine Mort through to the cameo roles including "Bob" (a pleasantly underplayed Philip Childs); the "Miss Understanding" of Matt Crandon and, of course, the saucy "Cynthia" of Julie Yammanee. Throughout the production there are many moments where the ensemble and its various members are given a chance to shine. It's true that some of the choreography could do with tightening in places and it is a shame that the production sometimes feels shoe-horned into a theatre really too small for it given there are various elements of the production that have had to be adapted, and even omitted, for the relatively small King's Theatre. That said, the show remains outrageously entertaining and it is no surprise that this production has been spruced up and revived for another tour and it remains one of those musicals that serve as a positive tonic to modern life, ensuring that every audience member leaves with a huge smile upon their face. Fabulous!! 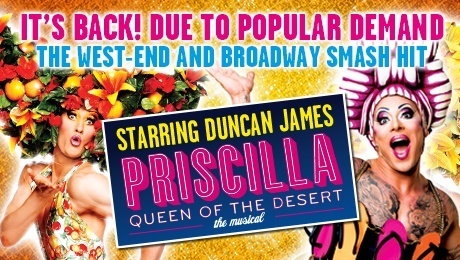 Priscilla Queen of the Desert is at the King's Theatre until Saturday 2nd April. For tickets and information visit the King's Theatre website.